Coming from years of renting in New York, we’re pretty used to living without incredibly easy access to laundry machines. Almost nobody I know has a washer and dryer in their apartment—you’re lucky to have a set in the building, but most people live a laundromat existence. We go back and forth. Our building actually does have a washer and dryer in the basement, but one or both of them are usually broken, so we end up at the laundromat a few blocks away. Fun fact: this one time, there was an enormous dead rat right in front of our building’s washing machine for like a week. Nobody picked it up but people did continue washing their clothes. All of this (except the dead rat part) is fine, and totally normal. It’s New York. I’m not complaining. But at the house, it’s kind of a different story. We are renovating all the time and we’re making a big mess all the time. This mess gets EVERYWHERE—the clothes we’re working in, obviously, but also bathmats, towels, bed linens, clothes you’re just wearing while not renovating…we are filth, basically. We’re pretty much constantly trying to evaluate which of our clothes look the least soiled, and therefore the most acceptable to wear in public. Our laundry situation quickly gets out of control. We stockpile it for a week or two and then have to take several hours out of the day to get to the laundromat with our four packed IKEA bags and pay too much money to use the machines there. The whole affair slows everything down since Max doesn’t have a driver’s license, so it’s not like he can just go do the laundry while I continue working on renovating something. Everything must halt. It makes me bitter and cranky, like most everyday human tasks do. I know. Cry me a river. Writing this out, it occurs to me that this probably sounds like senseless spoiled whining, and maybe it is, but the fact remains that I would basically give my left arm to have a functioning laundry room at this point. So we are MAKING. IT. HAPPEN. More accurately, the kind blog-loving folks at Lowe’s have generously offered to help make our laundry dreams a reality, and I’m so excited to be working with them on this room! Just FYI—Lowe’s has given me total creative freedom both with the room and how I write about it, so as always all opinions and commentary are 100% my own here. And, as always, I have lots of opinions and commentary to share. Anyway—let’s get to know the space, shall we? As you can see, it’s on the very petite side—about 5.5′ x 7′. 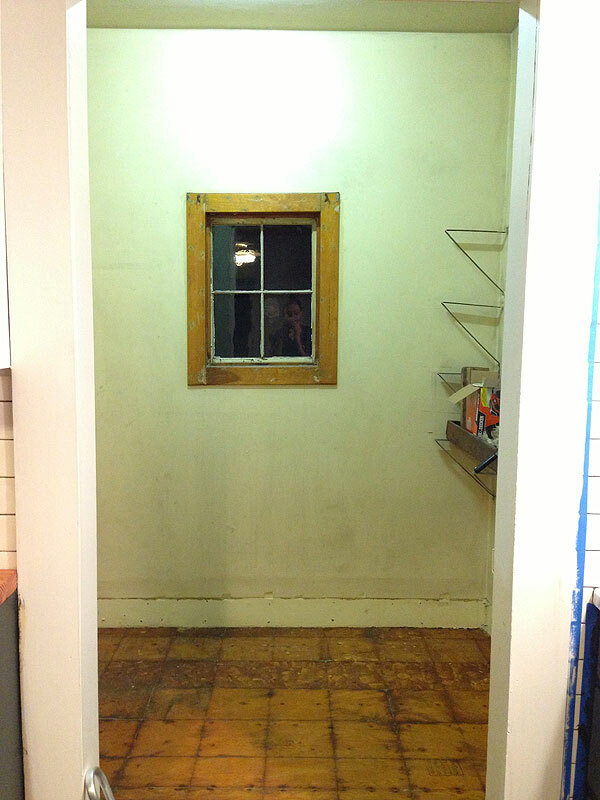 This is, apparently, the only photo I have of the laundry room in its true “before” state. Yikes! 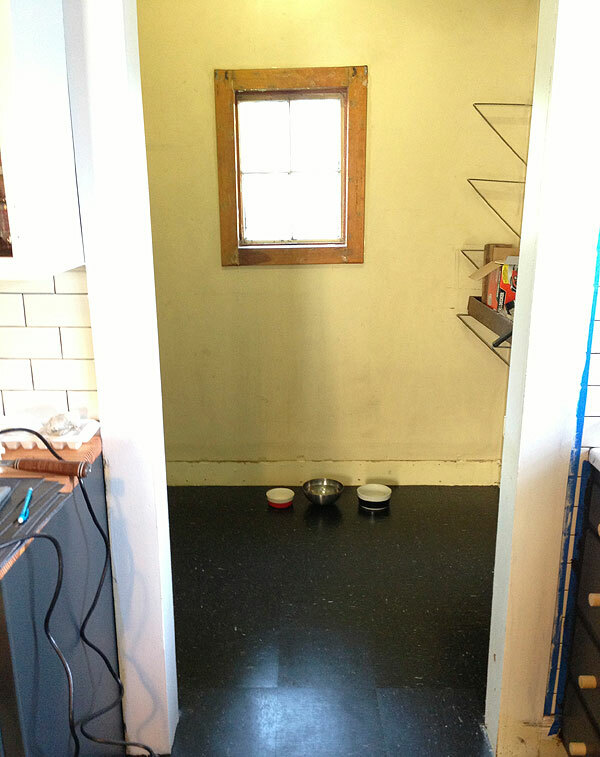 The room is continuous with the kitchen, so this was before I even removed the old vinyl tiles or anything. There was this retro metal cabinet in the room (which I had dreams about salvaging, but honestly…I don’t think it’s even worth it), and an old washing machine that was being held together with lots of different types of tape. It turned out that the washing machine did kind of work, except that we had no hot water on the main floor of the house until we got the boiler put in in November. As soon as we did get hot water, the washing machine broke entirely, and we were back to square one. So it goes. I know people like to inspect my floor plan and tell me to move the laundry elsewhere, but I promise this is kind of the only spot for it! While having laundry on the second floor would be kind of a luxury, I guess, there’s just no good place for it—even leaving aside the hassle and expense of running all the plumbing and electric up to the second floor. The existing mudroom is basically a glorified shed attached to the back to the house, so that’s not going to work, and I’d rather keep it here than move it to the basement. It’s a good laundry room! It will be, anyway. Since the laundry room is continuous with the kitchen and it’s so small, it wasn’t a big deal to just redo the floor and paint the walls back when we were renovating the kitchen over the summer. I removed the baseboards since they were super gross and not original anyway, and replacing them would allow me to install the VCT first and then the baseboard to cover the edges, so that base shoe wouldn’t be necessary. The new floor immediately made the space feel a little less like a biohazard, which is nice. The black VCT isn’t exactly my dream flooring material for this house, but I have to say that it’s been GREAT for right now. I think it looks good in the kitchen, it was easy and very inexpensive to install, easy to clean, and it’s extremely durable. Since we frequently find ourselves carting wheelbarrows full of plaster and brick and stuff through the kitchen to the backyard, the floor has been terrific. I bring this up because even though we do plan to re-renovate the kitchen someday, I don’t really want to think about the laundry room in those terms. With the exception of replacing the floor (probably with whatever we do in the kitchen), I’m thinking about this much more as a pretty permanent renovation job. We could stick a couple machines in there and call it a day, sure, but that wouldn’t be any fun. 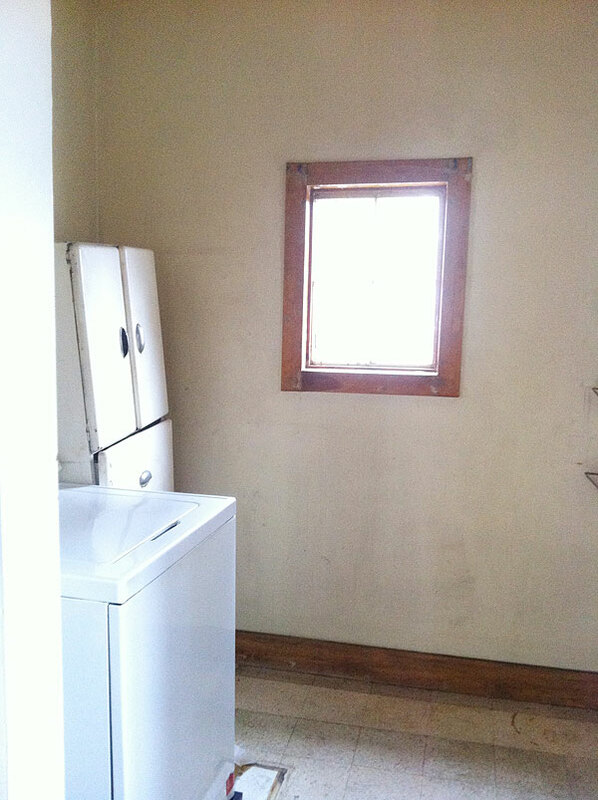 I want the laundry room to be pretty and nice…so basically the opposite of how it looks in these pictures. Can we just talk about this window for a second? Yeah, that is one incredibly sad-looking window. I know you might be thinking that this picture is crooked, but the window is actually incredibly crooked, along with the casing around it. As far as I can tell, that’s just how it was installed originally—badly, and without the aid of a level. It took me a while to figure it out, but I’m fairly certain that the window was actually stolen from the garage whenever the laundry room was built! The photo above is of the garage from last summer (YES, the yard is/was VERY overgrown…), and you can kind of see (if that enormous weed/plant wasn’t in the way) where the window was removed from the left side of the existing one, and the clapboard patched in. House history! 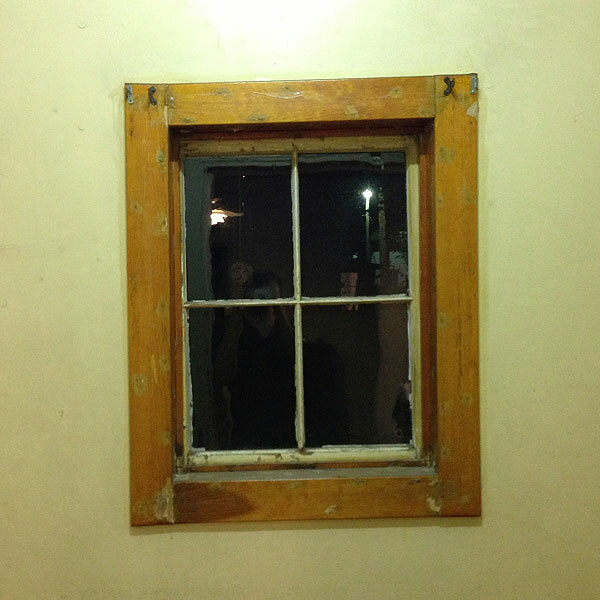 ANYWAY, the window in the laundry room…not cute. I think this is pretty much the only window in the house that I’d actually like to replace (and maybe put back on the garage! ), but it’s just not in the cards. New windows are crazzzzzyyyyy expensive, and dealing with trying to salvage something and install it is just a much bigger project than we need to be dealing with for this little space. Could the room handle a bigger, better-looking window? Yes. But! I have a couple ideas about dressing up the existing one, which I’m pretty excited about! I like a challenge. 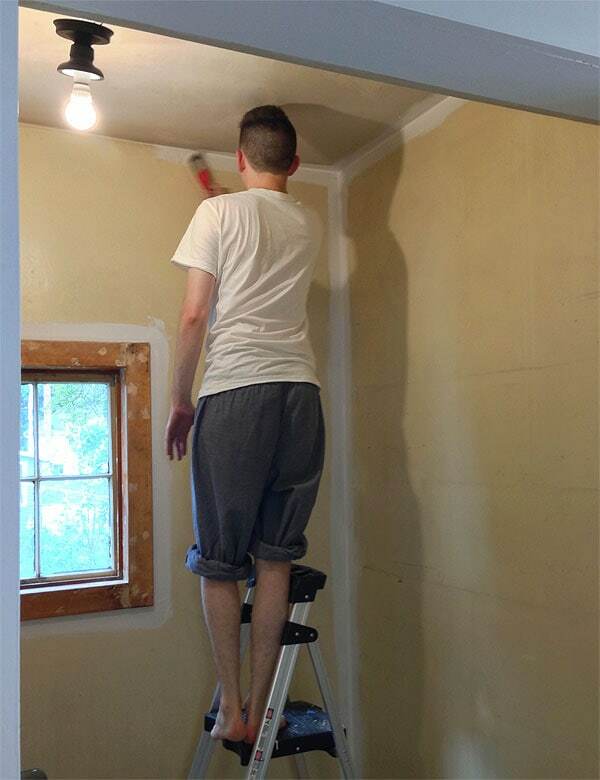 As the kitchen renovation was coming to a close, Max put on his work clothes (pajamas) and painted the laundry room!! Max doesn’t tend to do very much stuff like this—at least not by himself, anyway—so it was exciting to see him take on a project that felt manageable for him and see it through. He did such a nice job! Go, Max! We painted the walls and ceiling with the same white paint we used in the kitchen—Casa Blanca by Clark + Kensington in Flat Enamel. Once the walls and ceiling were painted, I cut and installed some plain 1 x 6 baseboards. 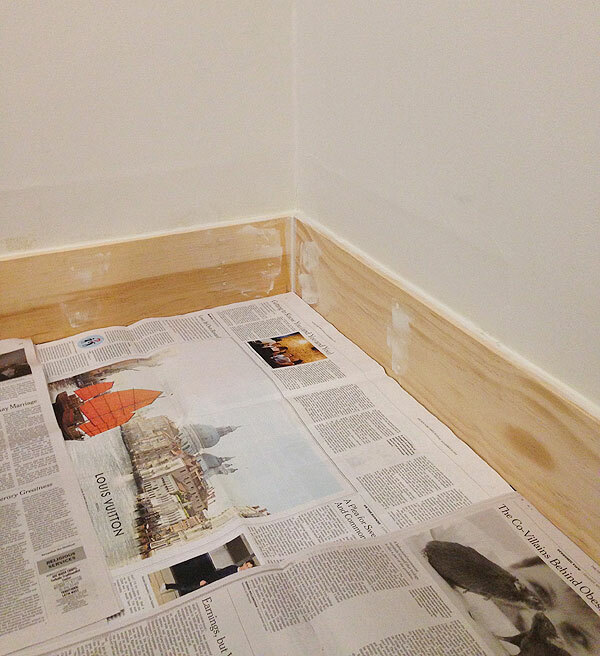 Patched, sanded, caulked, and painted, I tend to think plain 1 x 6 (or 8″, or 10″) pine boards work nicely as baseboards for old house/apartment renovations, generally…they’re inexpensive, and the size is much better suited than dinky new baseboard moldings. Of course, now that it’s months later and I have an actual plan for the room, I naturally want to tear out these baseboards and replace them with something a little more substantial and interesting and suited to the house. Oops! I don’t really like redoing stuff that I just did, but I kind of think I’ll regret it if I don’t. 1. I want to remove the existing window casing and replace it with molding similar to what’s on the doorframes in the kitchen. This molding profile is basically what was used in the “un-fancy” spaces in the house—the kitchen and the upstairs office, for instance. Other moldings throughout the house are beefier and more complex, but I think with some basic lumber and moderate woodworking skill, I can create a pretty convincing replica. This not only gives me the opportunity to make the window look a bit bigger and more substantial, but I also want to install it all completely level. The mullions and the window itself will still be off-kilter, of course, but I think installing the moldings level will make the window appear level. Depending on how that goes, I might do the same for the moldings around the doorway (the molding on the kitchen side is just 1×6 boards, and the inside is remnants of older molding, partially covered over by sheetrock…), and make new baseboards matching those in the upstairs office. I never really thought this room would require so much new millwork, but the more I think about it the more it seems worth it! And kind of fun, to be honest. 2. Since this room is right off the kitchen, I do really want to tie it in visually with the kitchen. So…MORE SUBWAY TILE! I know people have mixed feelings about subway tile (and there are plenty of black grout haterz out there), but it’s really inexpensive and pretty appropriate to old houses. I like black grout from a graphic visual standpoint, but I also like that it mimics the look of older tiles: really fancy old subway tiles had no spacers and no easement, so the dark lines between the tiles are just the cement peaking through. I’m planning to tile all four walls up to the height of the tile behind the stove and surrounding the sink in the kitchen (about 5.5 feet from the floor). They’ll be easy to keep clean, they can get wet, and the reflective surface of the tiles should bring a little more light into the room. 4. Above the tile, I want to line much of the room with antique hooks! We’re lucky to be able to source these from existing hooks in our upstairs closets. I think they’ll be very handy for hanging hamper bags, clothes that need to air dry, that kind of thing. 5. I’m undecided about the light for the room, but I keep thinking about a classic globe. I don’t want anything too crazy or too faux-vintage, and it has to play well with the faux-PH lamp in the kitchen, and I don’t want exposed bulbs because I want to be able to use my favorite super-energy-efficient Cree bulbs I like so much. The Luna Cord pendant from Schoolhouse Electric might be a winner! 6. Obviously Max and I have spent significant portions of our lives ogling Martha Stewart’s beautiful laundry rooms, and I always love that she decants her products into much better-looking containers. I’m thinking a mix of enamelware, glass canisters, and plain spray bottles will hold all of our laundry potions, corralled onto a shelf above the machines. I like this Enameled Bread Bin from West Elm for holding powdered detergent. 7. Shout-out to my iron! I love the classic Black & Decker iron. It’s built so well and it’s even sort of cute in its own way, and it works REALLY well. I feel like I’ll have it forever. 8. THE MACHINES!!! OK, like I said, lots of thought and consideration went into buying these machines. We ended up going with the LG 4-cu ft High-Efficiency Front-Load Washer with Steam Cycle and the LG 7.3-cu ft Electric Dryer with Steam Cycles, both in white. Aside from the pretty much unanimously glowing reviews they receive on Lowe’s website, we also liked that they’re a tad more petite than machines with the same capacity from other brands (we really wanted large capacity machines so we could do tons of laundry and wash big things like drop cloths, etc.). We need these machines to sit as far back toward the back wall as they can to not partially block the doorway, so it was exciting to find that LG machines aren’t as deep and that the dryer offers a side-venting option, eliminating the number of inches the machine has to sit away from the wall at the back to accommodate a dryer vent house. ANYWAY. I don’t consider myself particularly tech-nerdy, but HOLY MOLY these machines have, like, a bazillion features and I’m legitimately excited to use them. I’ve never had something so high-tech washing my clothes! Anyway, I know it might seem weird to be tackling another little room when, say, our dining room still doesn’t have a ceiling, but I’m so happy we’re setting aside some time to prioritize this! I’ve already been logging tons of hours in here, and naturally it’s already more complex than it seems like it should be, but I’m so excited to share the progress! It’s starting to look good! People who are finicky about laundry room placement are hilarious. Mine is in my basement, and I’ve had people say, “you have to go ALL THE WAY to the basement!” and I laugh and remember all the years of finding the perfect laundromat where I didn’t feel like I would get murdered. I like the idea of upholstering the counter as a big ironing board. It is an original idea. Of course, I have not ironed anything in years, so it probably would not make sense for me. My laundry room is in the basement, and I would love to have it off of the kitchen. You are going to be thrilled when it is done. Don’t apologize for working on the laundry room! Schlepping laundry out to a laundromat is not remotely sensible (time-wise, convenience-wise, or money-wise) when your own laundry room is just a few steps and a few days of work away. Your plans sound great, too. By the way, I love your blog and look forward to every post. Your sense of style and your writing are both delightful! Home laundry room is life changing. No more lugging multiple bags of clothes, and an immense time saver. Congrats! Have you considered a bar (rod? what are these things called?) to hang clothes from? We currently rent, and on a whim picked up a $12 rack from Ikea that we didn’t even think we needed. We use it all the time. Constantly, every day. Anyway, I think it’s great to focus on a small room that will make a big practical impact. You’ve made some great choices! I’m not sure I know exactly what you’re talking about, but I think we might put in one of those little retractable clothing lines (like this!) for just that purpose, or when the hooks don’t cut it! There isn’t really space for a permanent rod, but I think something like that would be very useful. I’m not sure if this is what Tracy is referring to, but I have one of these racks and use it ALL THE TIME. It’s amazing how many items it holds at once, and it’s easy to fold up and stash in the corner when not in use. As an aside, I really wish my laundry area didn’t look like an condemned dungeon. Oh yeah, we have a bunch of racks like that (ours are from Target)! They’re great, so we’ll definitely continue to use them when necessary. Oh, I just came here to suggest a retractable clothesline! Your readers are all so smart (and good-looking). We have a small laundry room also. I attached a closet-type rod above and parallel to our side by side washer and dryer. I hang shirts, t-shirts and coats from it to dry – significantly adding to the life of our clothes. There isn’t enough room to hang pants. When there is nothing hanging on it, it is barely noticeable. I dry bedding and towels in the dryer. On the opposite wall I have wire shelving (our house has no linen closet) from shoulder height up. I use s-shaped hooks (originally used to hang kitchen utensils) on the lowest shelf and hang our underwear on it to dry; I also hang jeans (on hangers) here. Below the wire shelving used to be chest freezer. Now I use the space for setting up folding clothes drying racks on which I hang socks, faceclothes, tea towels, cycling shorts, etc. I close the door and let the heat of the dryer (if it is on) heat the room like a British airing closet. In addition to longer lasting clothes, reduced elecriticity bills, I really love that I’m not going to end up with wrinkled clothes if I’m not around to fold clothes when the dryer cycle ends. Wait. There are people who don’t like subway tile? So just my $0.02 but if you’re dead set on upholstering the tops of the machines, consider doing it with a removable cover made from washable fabric. Every dryer I’ve ever owned (and some I haven’t) have a nasty habit of getting a film of lint all over the surface where the lint trap pulls out and partially everywhere else. Could you hinge your upholstered board to the opposite wall instead so it folds out for folding time and away the rest of the time? Hmmm, I didn’t think about that! Thank you! I don’t think the hinge thing would work super well here, but a removable cover seems doable! You might also want to consider a ceiling hook – we had one at our old place and it made it so easy to hang dry delicates on something like this – http://www.sourcingmap.com/rotate-hook-flower-shape-sky-blue-plastic-20-pegs-clothes-drying-rack-hanger-p-455900.html?utm_source=google&utm_medium=froogle&utm_campaign=usfroogle&gclid=CKrX3K7n9L0CFUNqOgod6wIAGQ – and also lay flat items like sweaters on a lay flat drying rack (although if you have your swanky lids of the machines, I guess you could lay it flat there. I also have a Black and Decker iron that I love. I attempted to replace it recently and am still using the B&D. Ellie, you make a great point about delicates and laying items flat to dry. Daniel, I wouldn’t presume to presume about your style in unmentionables (which I noticed were not mentioned in your recent discussion of your wardrobe), or Max’s taste….but you probably already know that those items that will last a lot longer if they are never exposed to the heat of a dryer include many types of undergarments. The same goes if your taste in long underwear, for example, runs to silk. And if you eventually acquire nice things like cashmere or hand-knit merino sweaters to go under that very fine jacket you have been coveting, you’ll no doubt research the best ways to care for them and learn that drying flat is a big part of the answer. Sweaters hold a LOT of water, however, so you might consider eventually installing a drain in the floor of your laundry room to catch the drips. Or plan to park your wooden racks or other sweater drying technology in your bathtub for the duration… which may last for a few days. Oh idea! about sweaters that drip. Not original to me, but: after you (carefully, gingerly, taking deep breaths) hand wash them, put them in your washer on the spin cycle *only*. Ta da! fewer drips. My apartment came with new window screens that I don’t use, but one of them is the perfect fit across my bathtub so I dry my sweaters that way. No need to hand wash sweaters. I have recently discovered that if you put a sweater in a lingerie bag on the delicate cycle, it comes out beautifully. Lay flat to dry, and it won’t drip. Our rack from target has a mesh net shelf for drying sweaters. I use Woolite in the machine, although it’s probably not necessary. Be careful not to include other items that might hurt your sweaters, like anything with a hook or Velcro. Also! Looks like the laundry room is going to be lovely. Excited to be able to follow along on another of your superfun remodels. years of apartment living have also taught me to appreciate having my own washer and dryer. This was my first winter as a home owner and with the ridiculous weather this year I was glad I didn’t have to carry laundry outside in the snow/rain/ice. Our house came with an LG high efficiency washer and dryer and now I don’t even know how we ever did laundry with the old apartment machines we used before. They’re great – you’ll love them. From one laundry lover to another, a word of warning: Front loaders can get stinky, so be prepared to clean the seals. Water apparently doesn’t completely drain from the basket because it’s placed on its side, or something like that. I dunno the specifics. All I know is that there were front loaders in the house that I bought, which made me super happy. Front loaders! Snazzy! But after washing I noticed that all of my clothes were smelling mildewy. Aftet Googling “stinky + clothes + front + loader” I found numerous “how to clean front loaders” articles, which prompted me to look under the rubber seal around the door, which prompted much gagging when I saw the sludgey muck living there. So… just so you know. NOTED! I’ve never had front loaders, either, so I’m sure we’ll learn a thing or two. The trick is to not close them. So keep that in mind when you decide on placement. You can either have the door cracked or swung all of the way open to the side(whichever intrudes less into your space)…just so long as there is room for air to get in there and let the machine dry. Otto has got it – don’t close it completely otherwise it will get stinky. Mine have never smelled bad and we keep the door cracked. Also, I live in Europe and have both a washer and a dryer in my apartment (thank goodness as I can’t imagine hanging EVERYTHING! Towels never feel soft when they’re hung!) I miss North American appliances like you wouldn’t believe. Our dryer isn’t vented – there’s a water collection tray in the bottom and things take forever to dry and the temperature is either hot or really hot which has resulted in many shrunken clothes and many more items that need to be hung. Many congratulations on your new purchases and on your partnership with Lowes – looking forward to seeing the finished room. Another tip is to not overdo it with the detergent. High-efficiency washers don’t need as much, and using too much detergent will create greasy mold colonies. Martha eat your heart out! I would check the height of the machine, ours would be way tall to iron on unless one used a stool. I think it’s 38″ high or somethin’. Yeah, I think it’s 38″. That doesn’t seem that high to me! We’ll have a regular ironing board for shirts and stuff, but I imagine this being great for linens. It’s only a little higher than a standard countertop! When completing historic renovations for tax credit purposes, the rule of thumb for replacement trim is this: If the room, or opening is original to the house, then match the original trim where it’s missing. If you create a new opening or a new room, then match the height and proportions of the original trim, but without all the detail (just like you did with your 1×6 baseboards). You are correct – using the wrong height stuff (even if it’s ‘fancy’ off-the-shelf trim always looks wrong). The idea is that you should be able to tell what is original and what is newer when you walk into a building. You could probably go either way with the laundry room, but the simpler trim is completely acceptable and probably the preferred method for historic renovation. There’s nothing frivolous about a laundry room – I’d tackle it sooner than later as well. Kristin, this is the same rule of thumb I have for my own house when it comes to the trim in non-original spaces! I had NO idea it was a Thing People Do or that it’s in keeping with historic renovation guidelines. How interesting! I think that’s just fine in there. We found it was more of a thing during the historic reviews for things like an added feature or closet in an original room. Imagine a square room (original) with a new closet added (bumping out into the room). The closet baseboard trim and door trim should be the simpler version so that it was clear that the closet was a later addition. And honestly, adding a closet like that hurts my teeth anyway. Our house had no closets, so we built in wardrobe style closets – they are clearly a different animal. A lot of the rules of preservation are really interesting (and some a little strange / funny.) You should dive into those in your spare time! I think you are doing a stellar job with your house so far. I absolutely agree that the laundry room should be a priority and I really like your plan. I just have one question: how are you going to deal with the piles of dirty clothes? Ok, having a laundry room in the house probably means that the dirty clothes won’t pile up that much, but still… Are you storing them in the laundry room or elsewhere in the house? I have a blue ikea bag next to the washing machine in our laundry/storage/weird small bedroom with closets and no space for a bed room, but I’m pretty sure that you wouldn’t settle for that. Maybe a nice big basket? Since you have the space though you might want to think of a way that you could have 3 “bins” to separate your laundry from the start. It makes things even easier. We have hampers in our closet upstairs like that, so I think we’ll just maintain a system like that! There’s no way that we’re realistically going to bring our dirty clothes down to the laundry room everyday unless we’re washing them, so I don’t think we’ll need much more in here than a basket to carry fresh laundry upstairs or something like that. You need a laundry chute. For some reason, they are uncommon in many parts of the country, but what could be better than a little door upstairs that opens into a duct that drops downstairs. Might be that the laundry room is too strangely located for this, but if you can find a shared wall that you can run a duct down, you will never have to carry laundry downstairs again. Ha, I wish! There isn’t any way to install one here I don’t think, but it would be fun. Well…spoiler…we’ve already got them! The washer so far is INCREDIBLE. We haven’t been able to use the dryer yet (installing the vent, getting the electric to the space…), so I’ll talk more about them when I know about that. It’s so funny how attached Americans are to their dryers! I kind of feel the same way. I LOVE line-drying, mind you, but it’s really only realistic here every once in a while…when it’s sunny and isn’t too muggy, etc. Setting up those accordion things all over the house is such a pain…I know dryers aren’t good for clothes or sheets or anything, really, but I love them nonetheless! I love laundry room makeovers. They make me want to get our more organized…but the feeling usually ends when the post is over ;). Also, whoever doesn’t like subway tile is just silly. Can’t wait to see how you transform the room! Thank you! Yes, I’ve heard keeping the door open and running vinegar through makes a big difference! Love this, and excited to see it once completed. 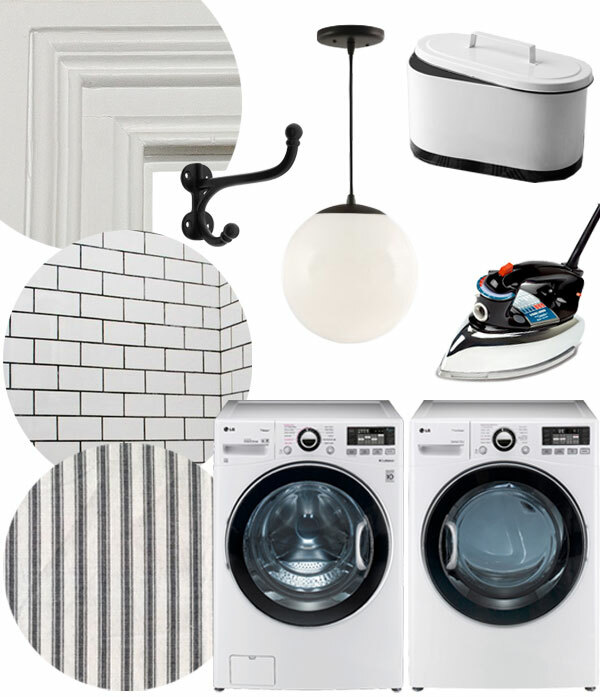 There really aren’t a lot of more modern laundry rooms out there to collect on Pinterest! The only thing I would personally be against is the upholstered countertop. You basically are planning to never put anything dirty on it. On a countertop. In a laundry room. Forget using it to sort dirty clothes at all. Spreading clothes out to spray stains. It just seems like a daily effort to NOT use a countertop, to hold back your instinctive urge to put something down on a counter. A solid surface would be much more usable. And you can always get an ironing pad that you can just toss on top of the counter, and roll up and put in a drawer/cabinet/basket when not in use. You could even make your own with your fabric. You make a valid point! An ironing pad might be the answer. Thank you! Anyway, can’t wait to see the progress! We actually have a clothesline in the yard already! The line itself needs to be replaced, but we definitely used it when weather permitted with the old half-working washer, and I think we’ll continue to now! When we bought our first house and moved from City Island to Atlanta, we screamed with delight over a dishwasher and laundry room!!! My husband always did the dishes so that was for him, I always trekked to the laundromat so that was for me!! Congrats on the laundry room. Ooops, I see the laundry line/rack issue has been addressed. Should’ve known you’d be thinking far ahead. The new laundry room with WC that we’ve created as part of our house reno is my new happy place. We put one of these http://goo.gl/JwYG5J ikea laundry racks above a radiator and it dries a whole load of shirts on hangers. I was just going to recommend these as well! Wow I suspect that in a while you will even go to the house just to be able to wash uninterupted. Over here (europe) there are very few top-loaders, I never heard of the problems that people mention in the comments about front-loaders. I do always leave the door ajar. I like that you can put stuff on top of the machine with a front-loader. We covered the machines with a cheap kitchen counter. We use our dryer only for the things I wash on 60 degree celcius. “Decantering your detergents” really Daniel, that is the gayest thing I have ever heard you come up with (no insult intended). It made me laugh out loud. I can’t think of any man I know who would do that not even the gay ones. For my husband that would be not even a foreign concept, it would be an alien concept. Martha sure knows how to get into peoples head (I have her housekeeping book as well). To each his own. Have a wonderful day! Hi, a few moments after posting this comment I realised -to my shame- that I decanter my soap as well, I changed detergents a while ago, but did not like the new brands box (it also did not fit into the space on the shelf as well as the old box size wise) so I kept the old box and put the new soap into that. Going off to eat my words now, sorry about that. ack, sorry about the goofy links, Daniel. Dryer-having / black grout-loving European represent! Haterz gonna hate! I’m pretty sure I bought a house upstate for the exclusive reason of never having to do laundry in the city ever again. While I love the fact you have a laundry room I might suggest for your city laundry pricing a wash n fold service. I am single and don’t have a ton of clothes/linens so not sure what you spend but after pricing the cost of the washer/dryer plus detergents and time spent at the laundry mat with what it costs for wash n fold I find it equals about the same money wise. Even if it costs a bit more the time saved is immeasurable. I spend a total of five minutes a week doing laundry (bag it, walk across street drop off and 6 hours later I pick it up) and will never do laundry again. Yeah, we’ve done that in the past and still do from time to time (it’s great! ), but I find that it gets really expensive with linens. Since we usually need to wash both clothes and linens, it just ends up making more sense from a cost perspective to just do it ourselves! Oh, good to know! Thank you! I agree that while a dining room with a ceiling is certainly nice, a functioning laundry room would rank right up there with a kitchen. It’s going to be so great to have that room working for and with you. Cant wait to see it! I recommend putting your washer and dryer on wheels. It makes it easy to move them for maintenance and cleaning. This intrigues me every time I see a U.S. laundry – where’s the sink? In Oz, there’s always a big sink, so you can hand wash, soak stuff, fill buckets, wash the dog, put ice in for parties …. I couldn’t live without mine ….what do Americans do without one? I think it might even be a requirement here to get your building signed off. That’s really interesting, Paula! It’s usually called a slop sink or utility sink here. They’re definitely pretty common, especially in new construction. We considered stacking the machines and putting one in, but ultimately decided that it wasn’t really necessary (the kitchen sink is literally 5 feet away) or worth the additional cost of running even more plumbing and waste line, etc. All the washers we looked at have a “soak” setting, and that’s all we could really think of that the sink would be used for! Everything else I think we can just do in the kitchen sink. And as a European with a dryer, I can see both sides of the argument, but just remember, energy costs are a lot higher in Europe than in the US. Many dryer owners rack-dry or line-dry their laundry until damp, then put it in the dryer. And yes, most nowadays are condenser dryers, but the better ones have no temperature control problems. Most construction in Europe is two layers of brick/breezeblock and a coat of plaster. Drilling a dryer vent through is often impossibly messy and expensive. My favorite thing in my (basement) laundry room is a heavy wooden closet rod, hung as high as I can reach so it’s not in the way. Yours could go wall to wall, just like in a closet. I never dry shirts and pants in the dryer but rather put them in the dryer for 5 minutes on high and then shake out the wrinkles and hang them on hangers (on the closet rod) to dry. Saves electricity and some ironing too. The rod works really well for big things like table cloths (when you get so you can use your dining room). Same deal, dry on high till it’s hot, hang over the rod where you can pull the edges smooth, no line crease because of the curve of the rod surface. The hanging things will dry quickly because of the heat from the sheets and towels and stuff that you do dry in the dryer. Win WIn. Laundry rooms are important and deserve lots of attention. Yours is going to be the BEST! I love all your posts, but I am particularly excited about this one because I’m also embarking on a laundry room remodel. It is also our mudroom and, revoltingly, where the litter box lives, so I’m going to have to pack a lot of function and some de-cattifying ingenuity into it. Ours is in similarly dire shape, maybe even more dire because the tattered yellow linoleum is still on the floor and – as some approximation of a backsplash – glued to the wall. Anyway! This got me excited and energized and I can’t wait to follow along! Ah, those “Sheila maid” things are super common in lots of the not-new apartments in Edinburgh, Scotland. They are great! Most of those flats also have the advantage of very high ceilings though. While lots of European properties, especially rental properties, don’t have driers, at least in Britain and Ireland, they ALL have washing machines IN apartment. If you’re looking for a flat and it doesn’t have a washing machine, it’s likely it also doesn’t have central heating or windows, and probably does have mice and holes in the floor. Then there’s having to supply all your own white goods in certain countries, like France. The same’s also true in Germany, and that also extends to supplying the entire kitchen (including cabinets) yourself (well, not in every apartment, but it’s rather common). i agree with one of the other commenters – sheilamaid’s are great. i am very much a non-dryer kinda gal but i live in australia and it doesn’t snow here like it does where you live! i’m excited to see what your laundry room will look like. all the best to ya. In sweden tumble dryers aren’t that unusual – but the really common drying aid is drying cabinet (or whatever that would really be called in english). It’s a cabinet about the height and shape of a small wardrobe, with a bunch of drying racks inside, that can be heated to dry your clothes, or left off to ler stuff drip dry. 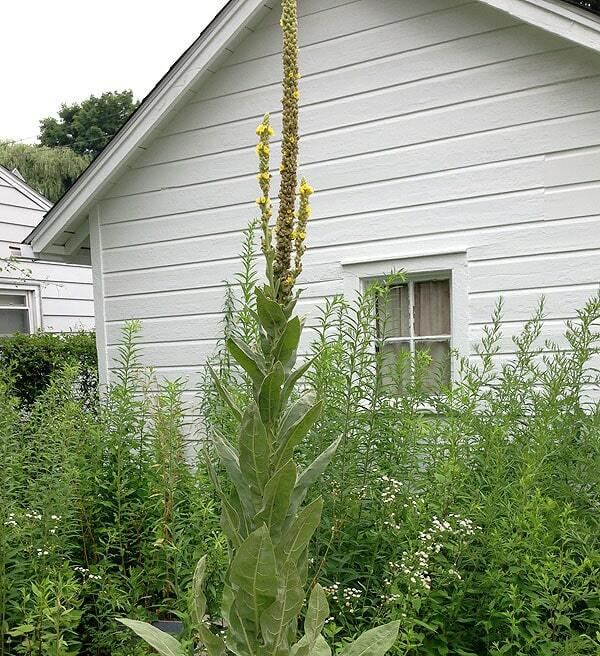 The giant plant/weed is a Verbascum/ Mullein. How I long to grow such a beautiful specimen in my own garden! Fascinating! We spent the summer calling it the “alien plant” because it seemed like it grew another foot every time we turned around! It died in the fall, but maybe it’s coming back? As a fellow New Yorker, I completely relate to this post. Almost 40 and I still haul dirty laundry with me whenever I visit my parents in DC. Now getting close to buying a weekend home and the thing that excites me most is…the laundry room. Who does not love subway tiles?!! I think a real counter with an ironing pad is the best idea. Also those cute containers for soap, they don’t seem that practical, I mean you are probably going to have left over soap in your original bin and still have to store it. When a space is too cute and everytghing match it makes me nervous!! (but that is me!) You could have a litle cabinet for your soap so we don’t see them. Its gonna look great as always. The window is very cute. I feel that this would be the perfect place for the tiny Martha portrait max painted, or possibly another portrait of Martha? a larger one? I’m not trying to insult the painting in any way (i honestly really like it). Regardless though, the room will come out great! That giant plant thing is amazing. ps. did you get my direct instagram picture thing? I’m just seeing the instagram thing! I didn’t even know that was a thing! thats a very good idea! and yeah sorry again if its not your style light or it was a weird way to send it i’m sorry. I love your plan – it is going to look great! You will not be disappointed with the LG machines. I purchased mine in back in November and they are AMAZING. They look great and perform very well – and quiet! I can’t wait to see the finished room! I have a ticking stripe headboard. So classic! I know, it’s SO ANNOYING. He finally got his learner’s permit, though, so hopefully he’ll be fully licensed soon. I can’t WAIT. It’s obviously not an issue in Brooklyn but there aren’t very many places you can go in Kingston without a car. It makes me insane. Isn’t the bicycle an option? Based on my experience, I would never buy a front loader. Just my $.02 on that issue. It will, however, be a real luxury for you to have your laundry room in house and easily accessible and being able to do laundry in your pj’s…. Although I love my shared laundry room and having three washers and dryers to get all my laundry done really efficiently. Good luck with your laundry room project. In Sweden there are very few top loading washing machines. You can definitely use powder detergent in every front loader I have ever used or seen. 1) My husband and I have been renovating for two years. Literally the only room that is 100% done is the laundry, and I don’t regret that even one tiny bit. We don’t have a floor anywhere in the whole house except the bathroom and laundry currently, and I’d still rather have laundry than a floor. Laundry 4 lyfe, bro. 2) As soon as I saw your laundry moodboard, I thought the orange light that was in the kitchen of your first apt. would be great with everything else you were planning. I know it’s got an exposed bulb, but it would be so extremely cute I thought I’d suggest it anyway. Why wouldn’t you tackle the laundry room?! Seems like a perfect extension of “finishing” the kitchen. And those machines look wonderful – I have a LG set that’s a couple of years old and while they aren’t as fancy as those models, they’ve been great. (and with two little kids, they get a work out!!) It’s fairly humid where I live, so I do struggle with the stinky front loader part now & then. Affresh helps & I’m going to try the wipe method another commenter suggested. So much helpful advice! PS – Lowes is SUCH a great partnership for you guys! Do you have the ability to add a pocket door to the space? I was thinking it could be nice to have the option of closing off the room or leaving it open. Though a good idea about sometimes not wanting to look at the laundry room, installing a pocket door is pretty invasive. Perhaps a Marimekko print drapery? I love subway tile but not so much with black grout. I found, to my chagrin, that when you do it yourself, no matter how good you are, you make mistakes. And the black grout really shows the spacing and alignment flaws up. White grout, in contrast, helps conceal the errors. Definitely keep the door open or cracked on your washer and follow the detergent/fabric softener guidelines – I love mine and it works great!! My husband jokes that he gave me a laundry room as a present, along with a dishwasher. But seriously, I’m in charge of the house right now, by common choice (he does most of the renovations and I’m working freelance), but we made sure that chores were as easy to do as possible. I can’t avoid the two steep flights of stairs in the house, but I can have a machine that handles my cachemeres and silks. I can’t prevent stains, but I can clean them quickly by having a good system to collect dirty clothes. However, like many French, I don’t have a dryer. I won’t blame people who have them (who am I, seriously, Miss Lesson Giver ? ), but I just found I didn’t need one. I had no space for a dryer in my Parisian studio, and have learnt to live without one, even now that I have a husband, two kids (one still on washable diapers) and two beloved cats that shed like crazy. It’s just a matter of not falling behind, but it’s taken me 5 years to make it work. Now I make a small “house tour” every morning when I wake up, open all the windows to air the bedrooms, make the beds and take the dirty clothes in the laundry room. All in 3 minutes after I’ve dressed and before my breakfast. It’s been 5 months since my laundry last “exploded” with dirty and clean clothes. Hope it lasts. And… if you care to check parisian metro tiles, like a reader above suggested, you may love it. We’re doing the kid’s bathroom with those tiles, and I just love them ! Love. love, love all things Manhattan Nest! I support your laundry room project wholeheartedly! It is the boring things that make the exciting things possible! However, I am concerned about your window plan. My take is that nice level casing will make the window itself look more crookedy. That will drive you to near madness and you will wind up with another vexing do-over. Is it completely coo-koo to pull the window out and reinstall it on the level? I bet you can do it! Selfishly, I’d like you to show how it’s done. :) So looking forward to the big reveal! Oh honey. I live in Europe and everybody I know has a dryer. I live by myself and I have one. Enjoy it! Yes! The jingle is so happy! I missed my “Your laundry is done!” song last night and was super sad. Dan, I would strongly recommend that instead of ripping out the plain 1×6 baseboards that you simply add a decorative moulding directly above it. It can be a simple small moulding (maybe an inch) or a full door casing moulding (up to 3 or 4 inches). A lot of older homes (especially as old as yours) had baseboards as tall as 14″ (though generally they are 10-12″. My 1923 home has 7 1/2″ plain baseboards, but it’s not the same style as your (gorgeous) house. Fortunately, our floors are more or less level! Houses definitely settle over time and can cause saggy floors, but saggy floors can also be indicative of structural problems below—it’s usually best to have that checked! I have no idea about the cost of repair…I’m sure it’s completely reliant on what (if anything) needs to be done! Congrats on the sponsored posts you keep getting! It’s really nice to see such an awesome blogger reap some well-deserved rewards :) so success! much excite! wow! I’m not sure if you’re going to get this far down into the comments, but I wanted to tell you about a window place that’s pretty near you. It’s called The Door Jamb in Ashokan, and I got great deals on overstocked windows there (divided light, wood on the inside). You won’t get a whole matching set, but I got some of various sizes for an addition to my house–for the main part I had to order new ones. Amy, I also wanted to say that (in my limited experience) there are various reasons that floors sag, and it’s worth having someone check yours out to see how easy or hard the repairs would be. If they are on the first floor you might be able to jack something up in the basement, or repair or sister the floor joists from below. Oh, that’s great to know about! I think we’ll probably need some new windows down the line, so that’s a good option to keep in mind if we end up buying new rather than trying to salvage. Late response, but about the front-loader odor issue: Affresh is nothing but compressed OxiClean (sodium percarbonate, sodium carbonate). You can buy store brand oxygen cleaner and put a scoop in your front loader drum before loading the clothes. I spin my drum back and forth to make sure all the powder has fallen through the holes. Some machines let you add it to the detergent drawer. I never had a smell problem until I ran out of the cleaner and kept forgetting to buy more. Use it every few loads, wipe the gasket after every load, and you won’t have any problems. Can’t wait to see your new space! I’m always inspired by your ability to make inexpensive/repurposed materials look good. I am so so so impressed with all the work you are doing and have done on this house. Your attention to detail and ability to work so hard for so long is inspiring. (We have been rehabbing a 1914 farmhouse for 30 years, and it is finally done. My husband initially thought it would be a 9 month project… ha!) Your parents must be so proud of you. I would like to offer to make your ironing board cover when you finally decide what you want. I have been sewing for 50 years and can handle almost any household project. You boys deserve something for all you do, and I would be happy to do this for you. Please just send me the measurements and what you would like and I will see what I can do.